Raw Hire proudly supports the Karratha Falcons Football and Sporting Club. Karratha Falcons Football & Sporting Club is based at Bulgarra Oval and participates in the North Pilbara Football League along with clubs from Karratha (Falcons & Kats), Dampier (Sharks), Wickham (Wolves), Port Hedland (Rovers) and South Hedland (Swans). The Avon Descent is the only water race where paddle and power craft come together. The unique 124km course from Northam to Bayswater tests the skill and endurance of competitors over 2 days in July. Raw Hire encourages their team to be part of their community and participate in their chosen interests. Raw Hire have supported one of their Managers Tom Petrickovic and his Avon Descent partner Pat for many years in the Avon Descent. Perth Metro Pipe Band is one of Australia’s fastest growing competitive and performing pipe bands. Established from humble beginnings in 2006, Perth Metro Pipe Band has over 50 playing members in two bands. The Met, as it is affectionately known, also performs at events for local charities, school fetes, Anzac Day parades as well as having performed for world renowned acts such as André Rieu, John Farnham and Ed Sheeran. “Our heritage at Raw Hire is something we are proud of, it’s important to us. Raw Hire supports the Perth Metro Pipe by providing funding and equipment to travel and compete in places like the Edinburgh Tattoo and World Championships.” Sean Clarke. 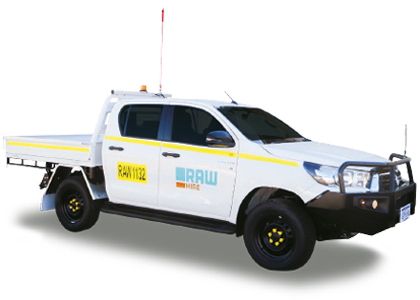 Raw Hire was the official vehicle sponsor for GDE during the production of the highly anticipated RED DOG: True Blue film. Good Dog Enterprises (GDE) is a Perth-based production company that creates, develops, produces and distributes quality film, television, stage shows and other forms of entertainment for worldwide audiences. GDE’s Nelson Woss produced the Award winning Australian feature films Red Dog (2011) and Ned Kelly (2003), and produced RED DOG: True Blue released in 2016. RED DOG: True Blue explores the early events leading up to Red Dog’s discovery on the road to Dampier and his ultimate rise from ordinary dog to Australian legend. RED DOG: True Blue celebrates an iconic Pilbara story with audiences in Australia and around the world. A key supporter of the business community in the Pilbara, the Karratha & Districts Chamber of Commerce and Industry has always been an advocate for Raw Hire. This has been evident through their business awards, and with the introduction of Raw Hire into its Business Excellence Hall of Fame back in 2010. 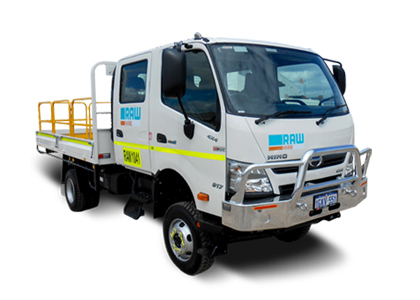 As an active business member of the community, Raw Hire are members of the Chamber of Commerce of Western Australia (CCI WA) and the Karratha & Districts Chamber of Commerce & Industry (KDCCI). The name, FeNaClNG, reflects the three main production and export commodities in Karratha and Dampier: Iron Ore-Fe, Salt-NaCl and Natural Gas-NG. Local community groups use the festival as an opportunity to raise much-needed funds. The Festival also provides locals with an opportunity to showcase their talents with many sporting events also being held in conjunction with the event. In 2012 we held the inaugraul Raw Meat Tray Raffle with Muka Meats. This classic raffle was well received and raised $7,200 for Lifeline WA. Raw Hire provided annual sponsorship for this yearly community event. The Spinifex Spree is a celebration of the diversity and unique characteristics of the Port Hedland community. The Spree includes a float parade, trade and craft displays and community group exhibitions, and a wide range of local entertainment. It is usually held on the second Saturday in August. Newman has their own public holiday to celebrate the region and all it has to offer. It gives the community the chance to come together as one to celebrate the Pilbara. Raw Hire were given the chance to support this weekend long festival.